What is it like to surf the Internet in the most secretive country on Earth? The short answer is - strange, at least by the rest of the world's standards. But as North Koreans begin to put their lives at risk just to connect to the outside world, it could mark a dramatic moment in the country's history. There's a curious quirk on every official North Korean website. A piece of programming that must be included in each page's code. It's just one facet of the "internet" in North Korea, a uniquely fascinating place. In a country where citizens are intentionally starved of any information other than government propaganda, the internet too is dictated by the needs of the state - but there is an increasing belief that this control is beginning to wane. "The government can no longer monitor all communications in the country, which it could do before," explains Scott Thomas Bruce, an expert on North Korea who has written extensively about the country. "That is a very significant development." There's just one cybercafe in North Korea's capital, Pyongyang. Anyone logging on at the cafe would find themselves at a computer that isn't running Windows, but instead Red Star - North Korea's own custom-built operating system, reportedly commissioned by the late Kim Jong-il himself. A pre-installed readme file explains how important it is that the operating system correlates with the country's values. The computer's calendar does not read 2012, but 101 - the number of years since the birth of Kim Il-sung, the country's former leader whose political theories define policy decisions. Normal citizens do not get access to the "internet". That privilege is left to a select number in the country, known as elites, as well as some academics and scientists. According to Daily NK's Chris Green, one of the many innovative ways being used to get information into North Korea involves attaching USB memory sticks to balloons, and floating them across the border. These sticks often contain South Korean programming - such as soap operas - and also the Korean language version of Wikipedia. It means that while most North Koreans do not have access to the internet, they can still use these USB sticks to get information about the world beyond their border. DailyNK is a website based in South Korea which publishes first-hand accounts of North Koreans both inside and outside the country. "Time and time again we hear stories of which James Bond would be proud," said Mr Green in a recent presentation. "Cellphones hidden in plastic bags and buried on hillsides far outside towns and cities, only being retrieved in order to make a single call, a call that must not last more than two minutes if the source is to avoid detection by the army of mobile electro-magnetic radiation detectors deployed by the Ministry of State Security." "The system they've set up is one that they can control and tear down if necessary," explains Mr Bruce. The system is called Kwangmyong, and is administered by the country's lone, state-run internet service provider. According to Mr Bruce, it consists mainly of "message boards, chat functions, and state sponsored media". Unsurprisingly, there's no sign of Twitter. "For a lot of authoritarian governments who are looking at what is happening in the Middle East," says Mr Bruce, "they're saying rather than let in Facebook, and rather than let in Twitter, what if the government created a Facebook that we could monitor and control?" The Red Star operating system runs an adapted version of the Firefox browser, named Naenara, a title it shares with the country's online portal, which also has an English version. Typical sites include news services - such as the Voice of Korea - and the official organ of the state, the Rodong Sinmun. But anyone producing content for this "internet" must be careful. 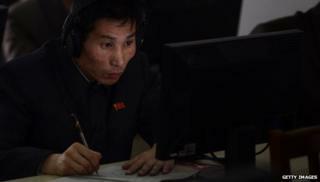 Reporters Without Borders - an organisation which monitors global press freedom - said some North Korean "journalists" had found themselves sent to "revolutionisation" camps, simply for a typo in their articles. However, it is believed this is restricted to just a few dozen families - most directly related to Kim Jong-un himself. North Korea's reluctance to connect citizens to the web is counteracted by an acceptance that, as with trade, it needs to open itself up slightly if it is to continue to survive. While China has its infamous "great firewall" - which blocks out the likes of Twitter and, from time to time the BBC website - North Korea's technology infrastructure is described as a "mosquito net", allowing only the bare essentials both in and out. And it's with mobile that the mosquito net is most porous. The handsets generally work within about 10km (6 miles) of the border between the two countries - but not without considerable danger. "The level of risk that people are taking now would be unthinkable 20 years ago," says Nat Kretchun, co-author of a groundbreaking report into the changing media environment in North Korea. "In order to make sure the mobile phone frequencies are not being tracked, I would fill up a washbasin with water and put the lid of a rice cooker over my head while I made a phone call," said one interviewee, a 28-year-old man who left the country in November 2010. "I don't know if it worked or not, but I was never caught." While the man's scientific methodology is questionable, his fear was certainly warranted. "Possession of illegal cellphones is a very major crime," explains Mr Bruce. This is North Korea's intranet, a closed system that those lucky enough to have access to can browse. Among the content are news websites, messageboards and other chat functions. Only the "elites" - members of high social standing - are permitted to use it, as well as some scientists and academics. The Red Star operating system, used by computers in North Korea, is built on Linux, the popular open source software used by many in the wider world. Its introduction music is believed to be based on a classic Korean folk song, Arirang. "The government has actually bought sensor equipment to try and track down people who are using them. "If you use them, you want to use them in a highly populated area, and you want to be using them for a short amount of time." With thanks to Flickr user comradeanatollii for the image of Red Star OS.